The Nou Camp is Europe’s largest stadium with a capacity of over 96,000 yet it isn’t easy to get match tickets because the club has more season ticket holders (‘socios’) than there are seats. 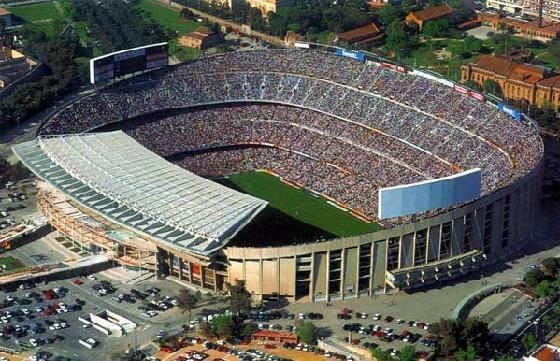 Therefore, very few FC Barcelona tickets go on general sale for matches. Spanish Fiestas has been selling Barcelona football tickets online since 1998 and continue to offer you tickets for all league and European matches throughout the season. If you’re travelling specifically for a game you should order your tickets in advance and collect them from one of numerous outlets in the city when you arrive. Kick-Off Times: Many fans travelling from the UK and other major European footballing countries will be accustomed to seeing their national league fixtures published in the summer preceding the start of a new season. This calendar of matches will usually confirm the day and time of kick-offs throughout the season. Unfortunately, that is not the case in Spain where the ‘Liga de Fútbol Profesional’ (Spanish FA) only announce this key information about 10 days before the match is due to be played which can prove awkward for football tourists. 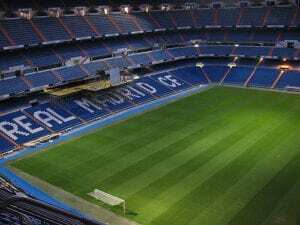 As soon as they confirm the schedule it will be published on the official FC Barcelona website. When making your travel plans please bear in mind that weekend games take place on Saturday, Sunday and Monday whilst midweek fixtures can take place on Tuesday, Wednesday or Thursday. As a rule Barcelona are very rarely involved in Monday or Thursday games and it’s fair to say that the vast majority of visitors have no problems provided they are in the Catalan capital between Saturday afternoon and Monday morning. Champions League fixtures always take place on a Tuesday or Wednesday with an 8.45pm kick off locally. These are always confirmed well in advance. The Nou Camp stadium lies about 5km west of Plaça de Catalunya which is at the top of the Ramblas in the tourist centre of the city. As you’d expect it is very well connected by the bus and underground networks and there are always plenty taxis happy to take you there. Getting away from the stadium after the game can prove time consuming as over 90,000 people hit the streets at the same time. Once you’ve got your tickets you are free to travel to and from the Nou Camp Stadium by any means you prefer. However, for your convenience we provide free return coach transport to the stadium if you order your FC Barcelona football tickets from Spanish Fiestas. Buses leave two hours before kick-off from outside the Hard Rock Café on Plaza Catalunya and stop in the Nou Camp car park. . This is just one of the reasons why you should buy FC Barcelona tickets from us. 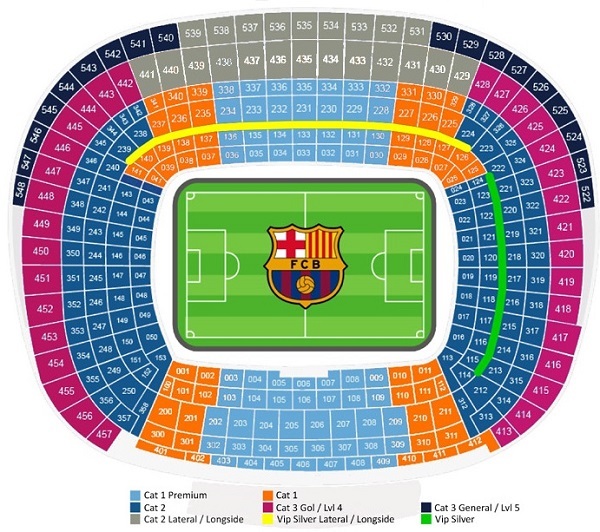 Please take a look at the following map of Camp Nou which shows you the area of the ground where you’ll be seated according to the category of ticket that you purchase. Why Buy from Spanish Fiestas? Unlike Ticketmaster, Viagogo, and Thomas Cook Sport we do not have offices around the world employing large sales and marketing teams. Instead we continue to operate as a small, independently run website which has been reliably providing Barcelona football tickets online since 1998.